The one organisation that cannot escape a major share of responsibility for the outbreak of violence in Belfast’s Ardoyne on Monday night past is the Orange Order. That is in no way to excuse the behaviour of those dissident republicans who plunged the people of Ardoyne into a totally unnecessary night of petrol bombing, rioting and disorder on their streets. This violence has more to do with putting dissident republican organisations on the political map than it has to do with addressing the injustice of an Orange march being forced past the shops at Ardoyne against the expressed wishes of the people who live in Ardoyne and those nationalist and Catholics who live along the route of the Orange parade. The PSNI also has to share responsibility for the part they played in mishandling the situation. It should not only have objected to but prevented the Orange march on its return journey home from the Field passing Ardoyne. Had the PSNI done this, the people of Ardoyne would have been spared the havoc caused to their area because those intent on causing trouble would not have had the opportunity to do so. Furthermore, the firing by the PSNI of plastic bullets at the rioters, the use of water cannon and the speed with which the PSNI employed both, but particularly the use of lethal and potentially deadly force, is totally unacceptable. 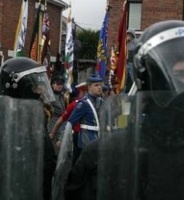 The PSNI should not have plastic bullets in their armoury. The PSNI should know that plastic bullets have an emotional legacy which runs deep inside the psyche of nationalists and republicans - the very constituency it is trying to convince it is a police service for all the people. Using plastic bullets disturbingly reminds the nationalist people of the worst excesses of the RUC and the British Army. They should be banned. Last Monday night the PSNI had the option of withdrawing from Ardoyne, thereby depriving those attacking it of a target. This would have contributed considerably to calming the situation on the ground and would have allowed local representatives an opportunity to restore order. In these very difficult situations the PSNI cannot behave as if it is the RUC because it is not. The PSNI needs to realise at all times it is now a police service for nationalists, unionists, republicans and loyalists. Its political antennae should have alerted it to the fact that it was not simply dealing with a law and order problem but in fact a touchstone issue - an Orange parade being forced through a Catholic district - with all the burden of a long history that accompanies such intimidation. One of the pillars of injustice the six-county state rested on was the special relationship between the Orange Order and the RUC and the way in which the RUC danced to an Orange tune when it came to forcing Orange marches through Catholic districts: Garvaghy Road, Lower Ormeau, Springfield/Whiterock, Short Strand and Ardoyne, to name a few that spring to mind. However, the source of Monday night’s disturbance and its fall-out must rest at the door of the Orange Order. It is the Order’s insistence on marching where it is unwelcome that is the basis for the annual acrimony and consequent political instability. To dress up, as Orange Order leaders often do, nationalist opposition to some controversial Orange marches as ‘anti-democratic’ or curtailing freedom of speech or assembly or against the order’s existence is self-serving nonsense. Nationalists and republicans accept the Orange Order as it defines itself; accept its right to exist as a cultural expression of a sizeable section of Protestants; accept its future on this island and in the north. The order’s existence is not the issue for nationalists or republicans, it is the manner in which it conducts its affairs, especially its marches, some of which cause offence. There is no doubt there is evidence that some inside the order are trying to modernise its appeal and reach out to nationalists. This is very welcome. I presume that is why the order is placing an emphasis on an Orangefest - a carnival occasion. If so then it has to follow this up and speak to Sinn Fein and residents and deal with bonfires, bigotry and unwelcome marches.